From CTIA WIRELESS 2010® in Las Vegas, Verizon Wireless and Skype announced Skype mobile™ will be available this Thursday, March 25, starting with nine Verizon Wireless 3G smartphones. Skype mobile uses the Verizon Wireless voice network for the wireless connection of the Skype-to-Skype calls, providing Verizon Wireless customers with a superior experience and top-notch call quality. 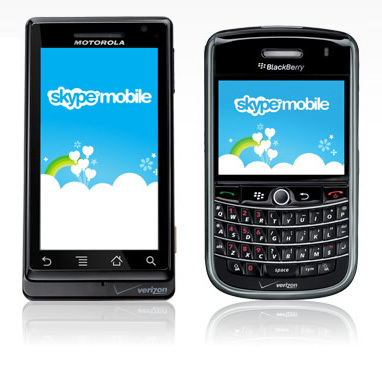 Beginning Thursday, new and existing Verizon Wireless customers with Android 3G smartphones and BlackBerry 3G smartphones can get Skype mobile in a number of ways. Visit www.verizonwireless.com/skypemobile or www.skype.com/go/mobile from a PC to enter the mobile phone number to receive a text message with a link to the application. Verizon Wireless customers can also text “SKYPE” to 2255 to receive the link. In addition, Android customers will be able to download the app from Android Market™. New BlackBerry customers will find the application on their 3G smartphones’ home screens in the Downloads folder when activated.